Silently: we convey, communicate, and contract. In laughter, frowning, way of walking, of brushing someone off, we feel the memory of a parent, friend, or lover, whose presence still inhabits us. A twitch or a gut reaction may be learned from generations back, manifesting traumas just below the surface of language. Hands and faces moving silently is the language for those that don’t hear. Sometimes silence itself is a gesture: the removal of sound allows us to consider the minute movements of facial expressions and body patterns. This loop explores unspoken communication through the silent video work of Erika DeFreitas, Margaret Dragu and Moira Simpson, Jacqueline Hoàng Nguyễn, and Véro Leduc. Bodies register feelings and words: hysteric laughter fluctuates wildly between holy and contagious, mothers and daughters enact lamentations and discuss power relations, two dancers negotiate the shift in their range of motion over time. We think with our skin, giving significance to the physical presence of an other through the touch of the viewer’s gaze, of deaf communication, of arthritic body, of learned gesture, of epidemic laughter. When we foreground silence, what is revealed? An image that has lived with the artist for some time now, has been of her and her mother laughing hysterically to the point of tears. When this fleeting image appears, they aren’t sharing the same space. There is a softness to the image – as if the light is shining through them. This imagery invokes the tradition of lamentation in religious texts, the phenomena of the weeping Virgin Mary statues, and the history of hysteria and anxiety. Balance Dance is a duet with Michelle Lui, a healthy 24-year-old dancer, tied and/or burdened with objects to “equalize” her range of motion and centre of gravity to Dragu’s own 63 year old arthritic body. Lui’s and Dragu’s movement exploration and research of balance tests by kinesiologists was combined with a lexicon of found movements obtained by observing seniors on public transit. This unique collaboration highlights the ways in which the range and capacity for movement changes as our bodies age. The video Documentation for An Epidemic Resistance explores the strategies used for the making of the sound installation For An Epidemic Resistance. 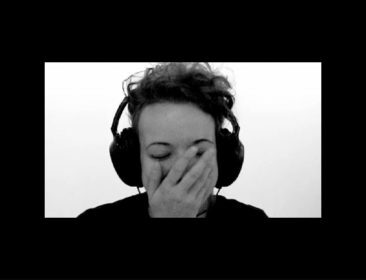 A number of participants acted as subjects for an empirical experiment where videos of people laughing their head off and without the use of humor were presented on a computer monitor to them. 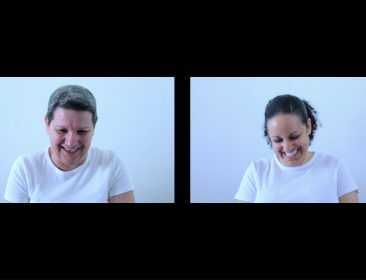 Contaminated by the infectious quality of laughter, the camera captured the minute movements of the participants’ facial expressions. La langue des signes québécoise ne se captant pas sur papier, la vidéo s’avère le média par excellence pour écrire cette langue visuelle. 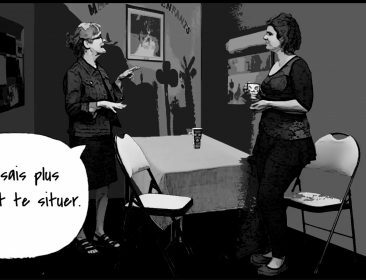 Première bande dessignée (une bande dessinée vidéographiée en langue des signes) entièrement bilingue, C’est tombé dans l’oreille d’une Sourde présente des rencontres avec des personnes sourdes et des membres de ma famille entendante. Une traversée dans ce monde qu’on dit « du silence », où des Sourd-es nous font signe de les écouter. Pour ce programme, nous présentons le chapitre où l’artiste est en conversation avec sa mère, Janine.